We're delighted to launch the very first M&S Heritage Trail across Leeds, created in partnership with the University of Leeds and Leeds City Council's Library Service. The trail is part of a suite of maps produced by the Council to help visitors explore the city. Bringing together the rich M&S heritage in the city, the Trail takes visitors from our Market Stall at Kirkgate Market in Leeds to our unique Marks In Time Exhibition here at the archive. Via key sights such as our first store in Cross Arcade, you'll explore the history of Leeds from an M&S perspective! You can pick up a trail leaflet and map at the Archive or at our Heritage Stall in Leeds Kirkgate Market. Our building is fully accessible for wheelchairs and parking spaces are avaiable for Blue Badge holders. 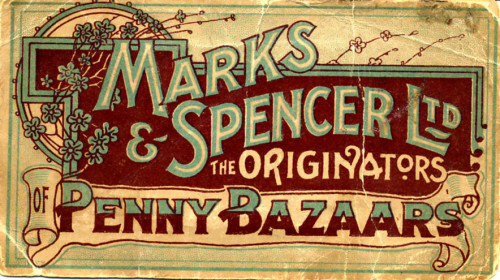 Did you know that the very first M&S goods were sold in Leeds from a 6ft x 4ft trestle table? Your M&S Heritage Trail guides you through the city revealing the unique story of Marks & Spencer. Discover how we developed from a humble open-air market stall to one of Britain's most successful retailers. There are now over 21 million visitors to our stores every week. As you follow this trail, don't forget to look around. You'll pass many important buildings which are part of the story of Leeds. The whole trail will take you about one and a half hours. Starting at Kirkgate Market, the route is slightly uphill most of the way, but is fully accessible for those with pushchairs or wheelchairs. To help you find your way, 'Walk It' signs are placed at various locations along the route.